The Concrete Gardener: Traveling Free for Six Weeks. When we decided to move to South Africa we were left with some choices over how to get there. We're going to be traveling for almost six weeks at a total cost equal that of just traveling directly to South Africa by plane. And at definitely much less cost than traveling to SA by plane and living for 6 weeks in either SA or Boston. For those of you who might want to try to travel "creatively", I wanted to detail how we're doing this. There are plenty of reasons why this particular itinerary wouldn't work for you. Don't let the peculiarities of this itinerary stop you from imagining another trip that really works for you. 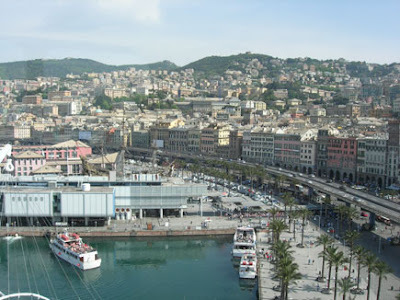 By Boat: Genoa-Cape Town (18 days, with stops in Barcelona, the Canary Islands, Senegal, Namibia). We'll have money reserved for food and gifts when we're not on the boat, so it'll come to more than this, but much less than we'd ordinarily spend on a regular month at home. A flight for the three of us from BOS-SA costs almost exactly $2,750 ($1250 X 2 + $250 for infant in arms.) So instead of paying $2,750 for the flight, we're paying $2,750 and visiting Eug's dad, our friends in Italy, and taking an amazing boat trip to Cape Town. We won't have a vacant home waiting for us. We also won't be paying for insurance or gas on a car. We collect miles, and we're not afraid to figure out ways to use them. We have a credit card that we try to use for everything, we sometimes get (free) credit cards for the sole purpose of getting the sign-up bonus miles (usually 25,000-50,000 miles). We're doing this between full-time jobs, So we're not taking (non-existent) vacation time. Some of the time, we'll still be working. Other times, we'll hopefully be pursuing some big writing dreams (for Eug) and some other big dream (for me). We're blessed to have friends and family that will take us in. We're going to Sedona and Milan to visit people, which is also a great way to see new places (through our host's eyes). We can't travel quickly or try to do too much with Noah, as he crashes after too much activity. Both of us have at least some location-independent income. While we're traveling, we'll do some work so we won't be giving up all income while we're traveling. That said, we will have few expenses other than those we've already paid for (the cost of the cruise and flights), so it's probably ok if we don't do any work whatsoever. We leave at the end of the month, so that tenants can move into our apartment by Nov 1. One way-tickets to Phoenix cost about $125 each, with Noah traveling free. Some one-way tickets are really expensive, so getting a cheap one way was a huge part of keeping our costs down. From Phoenix, we'll get a ride to Sedona, where Eug's dad lives. We'll spend about a week with Eug's dad and his family. Our flights from Phoenix-Milan (via Atlanta) cost 60 000 miles each, with only $5 per person in taxes. 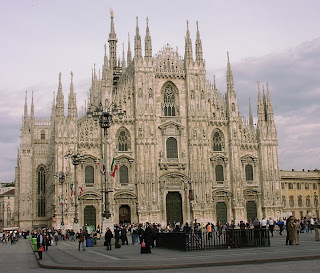 By traveling to Milan, we actually save a lot in airport taxes as compared to other European airports-- taxes can often cost upwards of $500 for three people (babies must pay tax on international flights), so $15 is truly amazing. We also save a lot by just having one stopover. Delta has probably the worst frequent flier program, but we have lots of miles with Delta so we're using them up on this flight. We had to search almost every day until a good flight came up. I have to give Eug credit for this, as he persisted in finding a really good route for us. 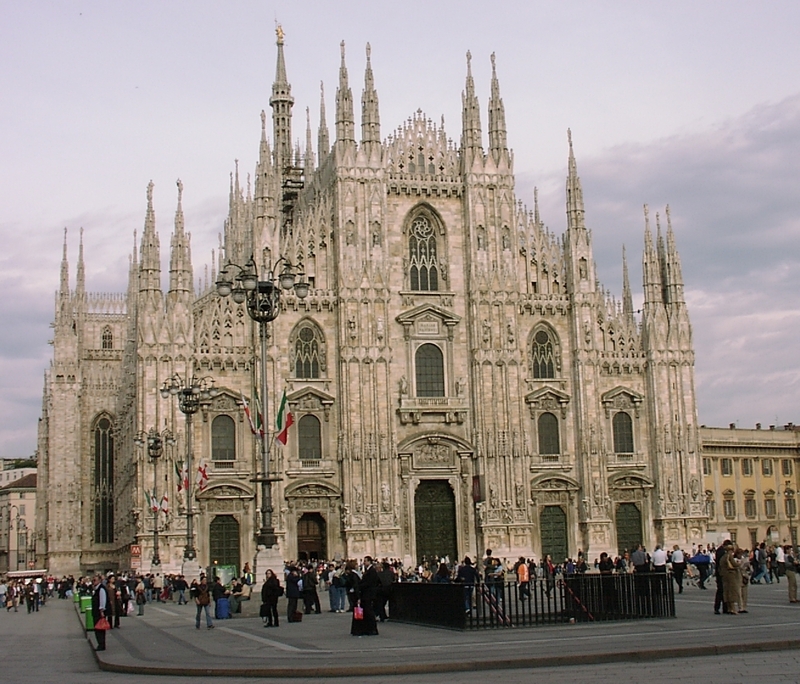 I was satisfied as soon as we found a way to get to Milan using miles, but Eug persisted until we found a non-stressful itinerary. Traveling with a baby, two direct flights with a long layover is much, much better than multiple flights with short layovers. We'll go to a cheap hotel in Atlanta (hopefully paying in miles again), catch up on some work, relax and probably take a swim in the hotel pool. (the alternative was traveling continuously for over 26 hours). In Milan, we'll stay with friends. I've been wanting to visit these friends for a very long time, so I'm so grateful that somehow it worked perfectly that we'll see eachother. It'll be Eug's first time in Italy; I have a massive sense of anticipation waiting to see how he'll like it. From Milan, we'll take a train or bus to Genoa, where we'll get on the Melody, a boat made famous by being hijacked by Somali Pirates. It's an older boat that spends N. Hemisphere summers in the Mediterranean, and S. hemisphere summers in the Indian Ocean. The trip is so cheap (900pp +taxes for 18 days, with Noah travelling free, for a total of about $2,500) because they have to get from the Mediterranean to the Indian Ocean in between summer 1 and summer 2, which is called a "repositioning cruise". For those of you who are interested in taking a boat as transportation, repositioning cruises are a great way to do this, because they're generally much cheaper than other cruises. Of course, again it works for us because we're actually trying to get to Cape Town. International one way plane tickets are notoriously expensive (more than returns, often). We're super excited about the cruise because food will be provided, and because we'll be largely without internet, and we'll see places along the way.